Portholme Church Portholme Road Selby YO8 4QH. 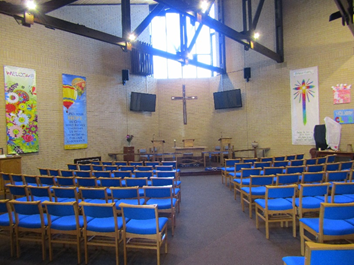 Portholme Church was formed in May 2012 as a Local Ecumenical Partnership (LEP) between Selby United Reformed Church and Selby Methodist Church. We will celebrate our 7th anniversary as an LEP in May this year and we continue to serve the people of Selby, sharing the love of Christ with all those in our community and beyond. Guided by the Holy Spirit, we seek to express the visible unity of the church, worshipping and working together to serve and minister to the needs of all and to nurture our existing membership so that we are better equipped to facilitate the acceptance into faith of those who seek the Lord Jesus Christ. Friday – 9.30am–11.15am Parents and Young Children (PYC) Group (term time). We have a waiting list to join, but you are welcome to call in for a visit. This is a new venture for Portholme Church. Our aim is to offer hospitality to anyone who would like to spend a couple of hours together. We intend to have some activities on offer or you can just come along for some company and a chat. Of course, there will be a drink and biscuits or maybe cake. We are hoping this will provide a meeting place for those in our community who are lonely or who would welcome the opportunity to meet and socialise with other people. Friends and Neighbours will be held every third Thursday in the month between 2.00pm and 4.00pm. First meeting - Thursday 21 March at 2.00pm at Portholme Church. Dates and information about future events. Click here to view the full diary. Tea & coffee are included in the ticket price of £10.00 (Students & under 16s £5.00). We will hold our usual "Bank Holiday Cafeteria" on each of the three bank holidays this Spring. 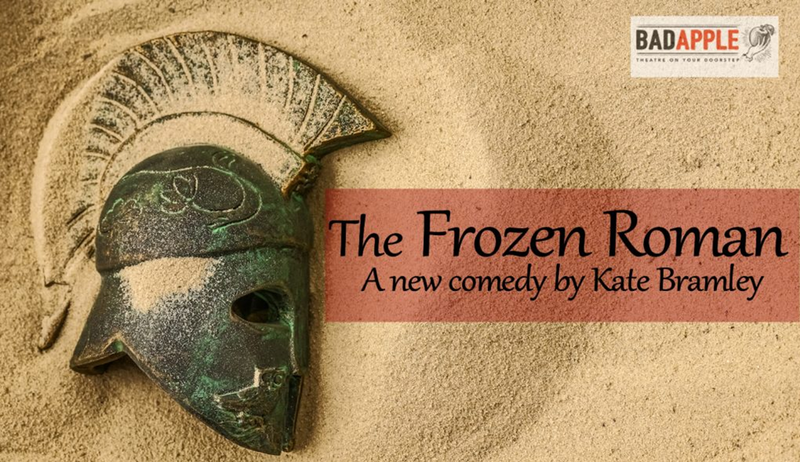 We look forward to the visit of the Bad Apple Theatre Group at 7:30pm on 24 May 2019 when they will perform ‘The Frozen Roman’. Bad Apple Theatre Group is one of the most prolific and original rural touring companies in the UK, working under the artistic direction of established comedy writer Kate Bradley. Based in rural North Yorkshire, Bad Apple specialise in taking high quality, original, comic performances to the smallest of venues nationwide. With a respected creative team drawn from BBC radio, TV and regional repertory theatres, you can be certain of an entertaining evening. The Portholme Church Parents and Young Children Group will be celebrating 25 years of happy Friday mornings in June this year. We think it will be great to have a reunion of past and present children, parents, and helpers who have enjoyed PYC over the years. There will be light refreshments and a chance to meet up with old friends, so please come and join us on Saturday 29 June 2019 from 11am to 3pm. The day will be run on an informal "drop-in" basis allowing members past & present to come and go as you please. If you have attended PYC at some time in the past 25 years, or know others who have attended, parents & grandparents included, or helped in the running of our group, we would like to invite you to our celebrations. Our format on Fridays has not changed greatly over the years and, judging by past photos, we are still using some of the original toys! Here we highlight one or two special events that have been held at Portholme Church recently. 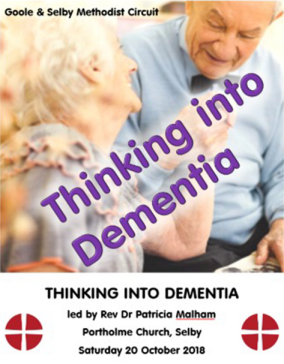 Thought provoking, informative, moving, funny, inspiring were all words that came to mind as we reflected on the training on Dementia led by Rev Pat Malham. Pat is a Methodist minister in the Ripon and Lower Dales circuit but has previously been a psychiatric registrar and a GP. She talked about the different forms of dementia and the many varied ways in which it manifests itself – everyone who was there will have learned something new. Pat talked about the importance of focusing on the person and what they are able to do and working to maintain that and encouraging as much independence as possible. 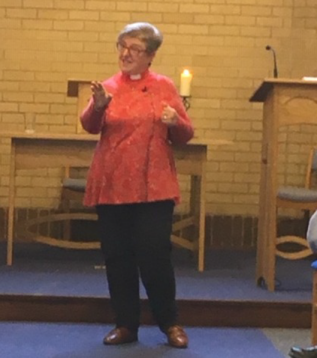 As a minister, Pat went on to help us think about the church’s role and if we believe that God loves all people and the gospel is for all people, it includes people with dementia. We were urged to adopt a positive attitude and to encourage supportive relationships. We were told that people with dementia may not remember what we said to them but they may, and often do, remember how we made them feel. Pat gave some very practical suggestions of things we can do to make an accessible environment as well as to encourage creativity and participation. As the church, we can do these things in fellowship, in worship and in walking alongside them on their continuing journey of life. 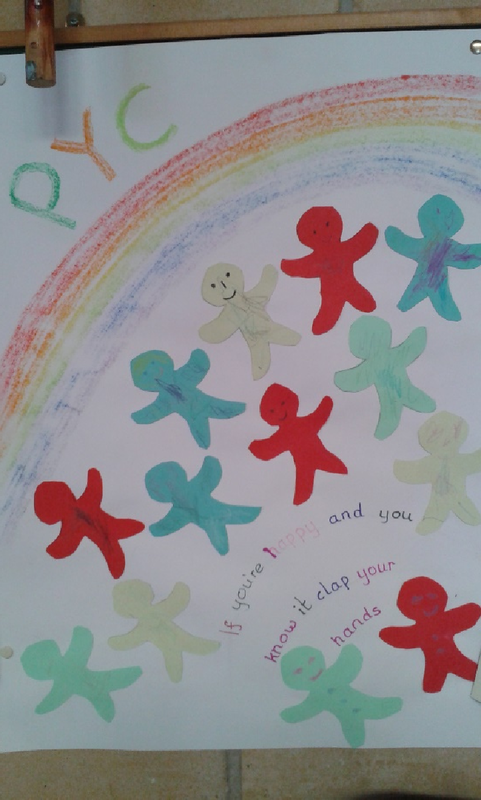 Pat included in her presentation art work, sculptures, poetry and prose created by people living with dementia. This memorable event was held on Tuesday 12th June 2018. From the comments afterwards, it seemed that everyone had appreciated Dan’s friendly, unassuming manner and melodic singing. 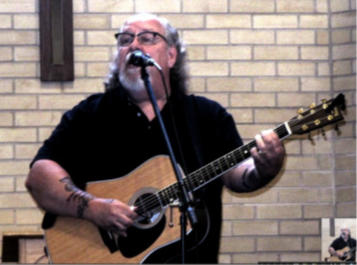 Dan interspersed his gentle songs of a simple faith with stories and anecdotes. We learnt that Dan was a high school theatre teacher until May of 2016. 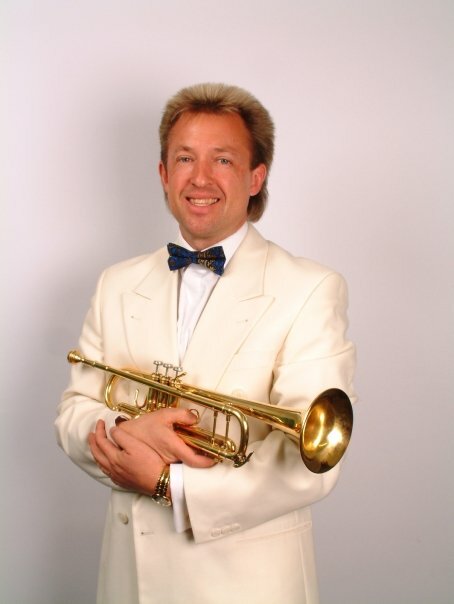 After 31 years in the classroom, he retired and began working, once again, as a full-time musician! 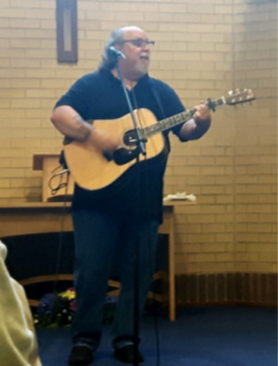 In addition to his two tours of the UK, he has performed at over 150 churches in the USA. He certainly demonstrated his mission: "Through the sharing of music, we can celebrate what God is doing in us, for us and through us! I am an old school singer/songwriter bringing a gentle Christian message of hope! I pray that our paths will cross and we can celebrate together!" As an interlude in the middle of Dan’s concert, a short video was shown appealing for donations to Hope School Beit Jala, which provides education and boarding for disadvantaged children aged 3-6 and 11yrs-18yrs from the West Bank area of Palestine. The children come from the neediest of families, and Christian and Muslim alike are brought up in a loving, Christian environment. The images were accompanied by voice-overs read by our members. After the concert we were treated to a fine buffet of savoury and sweet delights together with tea and coffee. 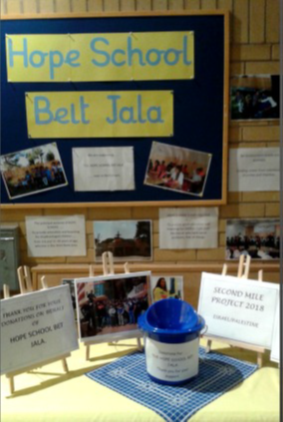 During this time there were collection buckets ready for our donations to Hope School and a further bucket for contributions for the buffet which, like the concert itself, was not charged. There was also the opportunity to chat to Dan and his wife and to purchase from his selection of CDs. WE HOPE TO MEET DAN AGAIN IN 2020 ON HIS NEXT UK TOUR! Portholme Church is proud to be an active member of "Churches Together in Selby", an umbrella organisation uniting all Christian denominations who are active in the town. This year’s annual "Walk of Witness" on Good Friday was very well supported. Portholme Church was packed for the pre-walk service which was led by our own minister, Rev David Coote. Following the service inside Portholme Church, the congregation walked together through the Market Cross shopping precinct to the town’s market place in front of Selby Abbey where an open-air service was led by members of King’s Church. The congregation were warmed with refreshments inside the Abbey after the open-air service. "Good Friday" is the bleakest moment in the Gospel story. When we read the story of Jesus’ arrest, trial, and crucifixion today, we have the benefit of knowing that it’s all leading up to the triumph of Easter. But to the Jesus-followers present at the scene, it must have seemed that the world as they knew it was falling apart. We have recently made some significant progress in creating a new and more colourful worship area. From the very beginning, our aim has been to ensure that Portholme Church is not just given a facelift but is renewed and ready for worship in the 21st century. All the chairs were re-upholstered early in the autumn and the upgrades to our audio visual equipment were completed just before Christmas. This year, the sanctuary cross has been given its new wooden surround. The cross is now much more prominent and, pleasingly, the feedback has all been positive. New wall banners have been produced and are now in place on the walls. 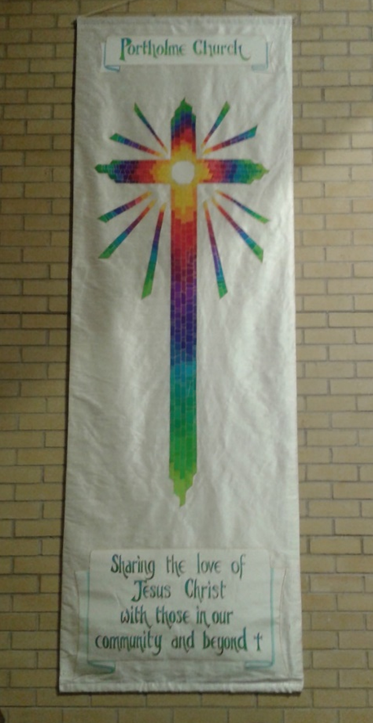 Copies of the new “Portholme Church” banner, which was made for us by Yvonne Bell*, are available as bookmarks. Visitors to Portholme Church cannot miss the new artwork that is on display in the foyer. We hope the pictures will prove spiritually uplifting and inspirational – we’re looking forward to hearing people’s reactions. At a local arrangement service in September, we thought about journeys in a number of different ways. We looked at the journeys some of us took across the UK and further afield before settling in Selby. We were then challenged to think about our spiritual journey - not only as individuals but collectively as Portholme Church - how we can see God at work now and where He may be leading us in the future. Throughout the service we made a note of some key words that came through the bible readings, the thoughts that were shared and also from the congregation. After the service people added to the list those words that were important to them when thinking about Portholme Church. We promised that we would use all of the words and make them into a "Wordle". The following week everyone was given a copy of the Wordle and were encouraged to think about any other words that should be added before we produce a final (for now) version that we hope we can make into welcome cards for anyone visiting or wanting to know more about Portholme Church. We have also updated the large version and put it on the notice board in the foyer so that people can see at a glance what is important to us as a church family. People will use the Wordle in different ways. For some, it is really useful as a focus for reflection and prayer, picking out different words and those relating to activities that are part of our church life or that we support, helping us pray for them and the individuals that lead or benefit from them. Other words lead us to ponder on what God may be saying to us as individuals or as a church and what He may be saying about where He may want us to go over the coming months and years. It will be interesting to produce another Wordle in a year or two and see how much has changed. Some of the things that are fundamental to our faith will remain but it would be good to see new words appearing as we continue to move forward together as a church. 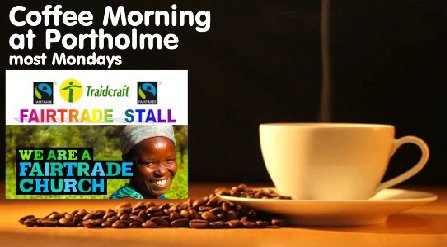 We hold a coffee morning every Monday at Portholme Church to raise the funds necessary to keep the church open but, once a month, we dedicate the funds raised to a charity that has been nominated by one of our members. We aim to support a wide range of charities who are working to help others locally, nationally and internationally. In July, we raised a record amount of £151.25 to go to the Grenfell Tower Fire Relief Fund. 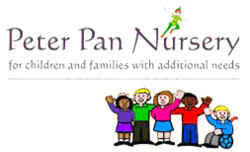 In August, a more usual amount of £44.96 went to the Peter Pan Nursery in nearby Sherburn-in-Elmet and in September people responded again with great generosity to give a total of £102.45 to Macmillan Cancer Care. The Coffee Morning is "open" every Monday from 10am to 12 noon. Everyone is welcome and it’s a wonderful opportunity to meet up and chat with friends. Do join us! The theme for our annual HOLIDAY CLUB this year was "The Guardians of Ancora". The Holiday Club was open every morning from Monday 14th August to Friday 18th August. Portholme Church was transformed into the Guild and Hall of Memory for the city of Ancora and we played host to 30 keen and eager young Apprentice Guardians. The Guardians of Ancora is a fantastic, week long, programme of activities (developed by the Scripture Union) which is crammed full of exciting activities, great Bible teaching and introduces children to Jesus and tells of the amazing things he did. During the week, the world of Ancora, the City of Hope, is introduced. At the summit of Ancora stands the Spire of Light which lights up the whole city. The stories of the Saga (the Bible) are told there every day, and the power of storytelling fuels the light of the Spire. Each story of the Saga is represented by a story-treasure (some sort of object or artefact): these are stored in the Hall of Memory. Once, the Hall of Memory in the city of Ancora was filled with wonderful story-treasures, but now, many of these objects have been lost. The people of Ancora are determined to recover the lost story-treasures so they can, once again, tell the stories. The existing Guardians have recovered some of these but others still need to be found and so they have sent out an appeal for new recruits and this is where the Apprentice Guardians join the story. Each day the Apprentice Guardians set out – with the help of the Keeper of the Keys and Kal the Aquaneer – on a quest to find a story-treasure, return it to the Hall of Memory and explore the story it represents. What happens during the Holiday Club? Well, there’s laughing, learning, singing, dancing, praying, talking, listening, thinking, laughing (yes we did a lot of that!) 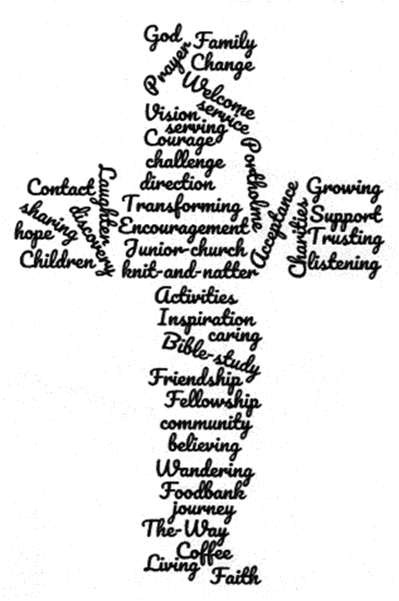 and let’s not forget this is a way of reaching out to some of the estimated 95% of children and young people in England and Wales who aren’t in church and providing a way in for children to find faith, grow in faith and reach out to their friends in faith. The content of this is site has been compiled by the people of Portholme Church. Copyright © 2019, All rights reserved. www.portholmechurch.org.uk.